Ray Carr was born and raised on the island of St. Vincent. He grew up in the Anglican Church where his aspiration was to be a priest. Through a very good friend, he was invited to a Baptist church which was started by Southern Baptist missionaries, and there came into a relationship with Jesus Christ. Ray and his wife, Deborah were married in 1992. They have three children: Darrel, Travis and Brianna. In 1991, Ray became the Pastor of Glen Baptist Church, where he pastored until coming to the United States to further his studies in 2001. During his tenure at Glen Baptist Church, Ray and Deborah both completed their Associate's Degree in Theology at the Barbados Baptist College. While in St. Vincent, Ray served two terms as President of the St. Vincent Baptist Convention as well as Chairman of the National Advisory Council for Evangelism Explosion. 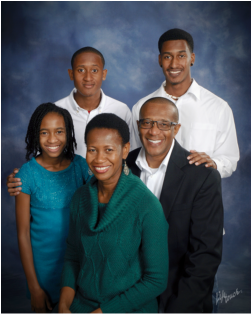 Ray and his family left Glen Baptist Church to continue his studies in the U.S., beginning at Baptist College of Florida where he earned his Bachelor’s in Leadership/Counseling. From there he came to Southeastern Baptist Theological Seminary in Wake Forest to earn his Masters of Divinity in Christian Ministry, which he completed in 2011 and a Doctor of Ministry in Biblical Counseling in 2015. During his time in the U.S., Ray has been on several mission trips to Burkina Faso, Nigeria, Philippines, Haiti, Mississippi and Florida. Ray preached his first sermon at Baptist Center in February 2012 as pulpit supply during the time that the church had been searching for a full time pastor. After speaking several times as a guest, both Ray and Baptist Center began to sense God's divine plan and Ray became a candidate for the position. Ray was voted in on May 30, 2012 and began his full time service as pastor of Baptist Center on August 1, 2012. Ray enjoys cooking, gardening and photography. He loves God, loves his family and loves to preach the Word of God.